" I just wanted to thank you for the great product! It literally kept my life safe as I completed a job that I would otherwise not be able to do. Attached are a couple of photos from the top of a three-story house where I was cleaning solar panels back in January. If we are ever in need of more anchors, I will make sure we purchase the M-3 SeamSAFE anchors. Thanks again for a life saving product!" "The SeamSAFE anchor was an excellent choice for myself. There was no need to put permanant anchors on the roof, causing an unappealling look or leaving unsightly patched holes. The ease of movement is excellent. I have loaned the anchor to several roof contractors and hood cleaners. They ask how they can get one, and I give them the info. Every roof contractor should have several of these to fit the different roof ribs, and I plan on ordering another one." "These anchors are a lifesaver. They are affordable, well constructed and easy to use. Anchor points on roofs can be a pain, but at least when we are installing roofs, we dont need to worry because these anchors are the solution." "We were looking for an anchor for standing seam roofs. It had to be cost effective and portable. After doing research online, I found the SeamSAFE anchor. DJ Construction has been in buisness for 60 years and values safety in the construction industry to be our number-one priority. This anchor fit the criteria we were looking for. We not only use this anchor for residential standing seam applications, but for commercial steel building standing seam roofs. It is a great safety tool while working outside the safety line." — Jaye Sleppy, DJ Construction Co. Inc.
"We bought two of these for low slope standing seam repairs. They work fantastic and as the old adage claims, you can never be to careful. Other contractors have seen us use them and everyone says, "WOW where did you get them?" "The company I worked for used the SeamSAFE Roof Anchor on a project in Northern Alberta. The crew found it easy to attach to the seam, and it was quickly moved to the next seam position. We used them in pairs on two, so we stayed 100% tied off. We will have ours tested in Canada now that we have tried them and like them." — Dwayne Robarts, Stonehouse Safety, Inc.
"Our company uses only SeamSAFE Roof Anchors when sheeting pre-engineered standing-seam roofs. They are easy to install, and the employees are willing to use them. SeamSAFE is a great company to deal with." — Joe Stang, Coletrane Industries Ltd.
"The SeamSAFE Roof Anchor is one of the quickest systems arround for fall protection solutions for standing-seam roofing. We tried others. We use SeamSAFE." "We bought a different brand, and the design just didn't work well. 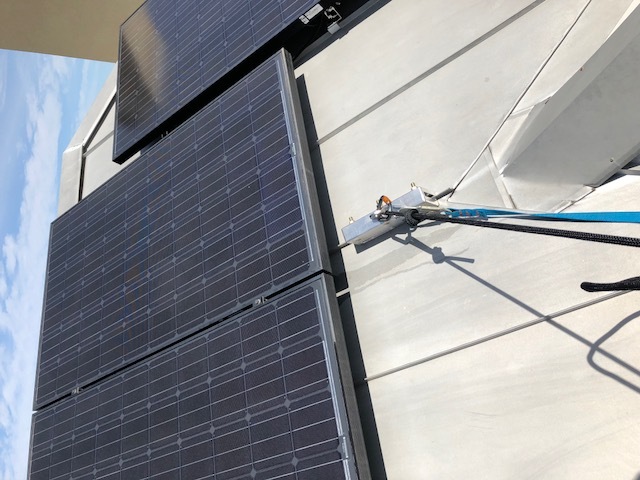 We found the SeamSAFE Roof Anchor, and it works great!" "Multiple set bolts is way more appealing than the competitors' single." "We have used the SeamSAFE anchor twice since we bought it, and each time it worked as intended. Both applications were on steep standing-seam metal roofs - once for cleaning and the other for ridge inspections. We will probably buy more." — Richard Tennyson, RMS Orlando, Inc.
"Your device was the only method acceptable on a project we are finishing at a local refinery. It saved our backsides. We will now incorporate its use on all our standing-seam projects. Thanks." "The anchor is very easy to use. The guys feel much more secure with it. They like the single-wrench install." — Eva Derrickson, Landmark Construction Companies, Inc.
"The anchors are working brilliantly!" "Excellent customer service, and prompt ordering and shipping. Greatly appreciate doing business with SeamSAFE!"